Dolphin Watching in Fernando de Noronha . Would love to see Dolphins in the middle of the Atlantic? Dolphin Watching is one of Noronha's favorite activities. One of the best locations in the world to observe Rotifer Dolphins is at the site officially known as the Baia dos Porcos (The Bay of Pigs), but now commonly called the Baia dos Golfinhos (Bay of Dolphins) in Fernando de Noronha, where they can be observed in their natural habitat. 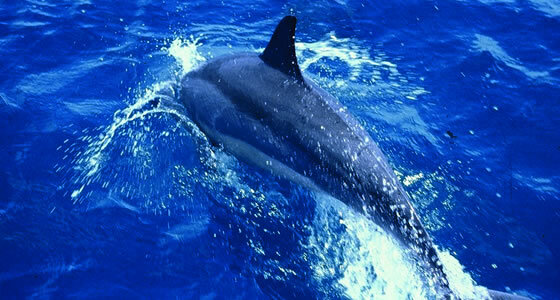 In fact the waters surrounding the island are supposed to be the most important breeding ground for dolphins, globally. Rotifer or Spinner Dolphins, called so, because of their characteristic of rotating their bodies while jumping, can reach a length of about 2 m and about 90 kg when fully grown. These dolphins, whose technical name is stenella longirostris have a dark grey back with light grey stripes and a white abdomen.They have a multifaceted social structure and can usually be found in groups, ranging from 2 to 200. The best time for watching these fascinating creatures is at sunrise, from around 5.30 AM to around 8 AM, when the calm sea waters of the Bay of Dolphins draw them in, usually in large numbers. Here they rest, reproduce, suckle and can sometimes be observed communicating with each other, while in the afternoon they move to the high sea to search for food. For an hour after the last dolphin leaves, associates from the Spinner Dolphin Projects (Projeto Golfinho Rotador) are available at the site to provide information and answer questions of the visitors. In order to protect these animals, the government has prohibited boats from approaching this bay, which forms a part of the National Marine Park, so the only means to watch these animals is by making your way down a path that runs for about 1km from the Sancho Beach parking lot and along the edge of the cliffs over the Bay of Dolphins from where their acrobat like performances can be observed.